Heating and ventilation systems are required by all local building codes because of health and safety concerns. Air conditioning is a relatively recent innovation and not required by code, though it is rarely omitted in hot or humid climates. An evaporator is located outside of the building. 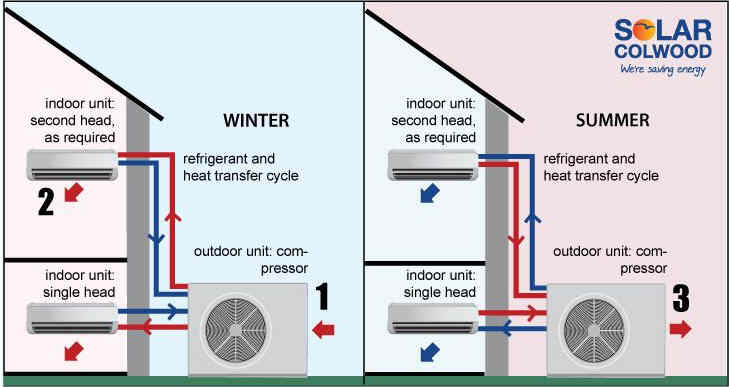 It houses a reversible compressor or heat pump that regulates the temperature of the refrigerant in the coils (See more about heat pumps here). The fan in the air handler blows air over the coils and through sheet metal or foil ducts to registers in each room. 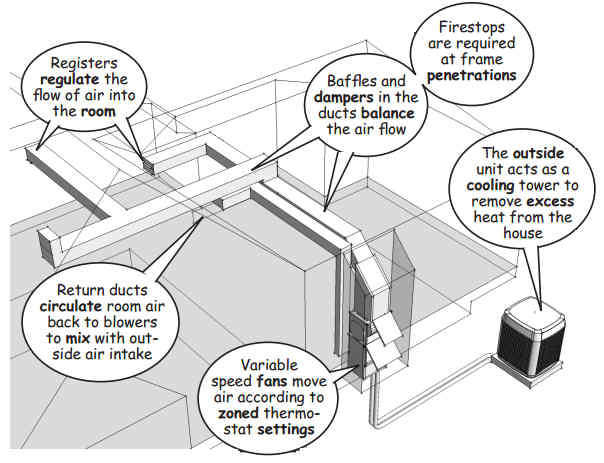 Dampers and mixing boxes in the ductwork direct air flow according to zones controlled by a central thermostat. Most residential systems do not include return air ducts. Instead, an opening is located near the interior unit so air can be drawn back into the air handler to repeat the cycle. The result can be quieter and more energy efficient. 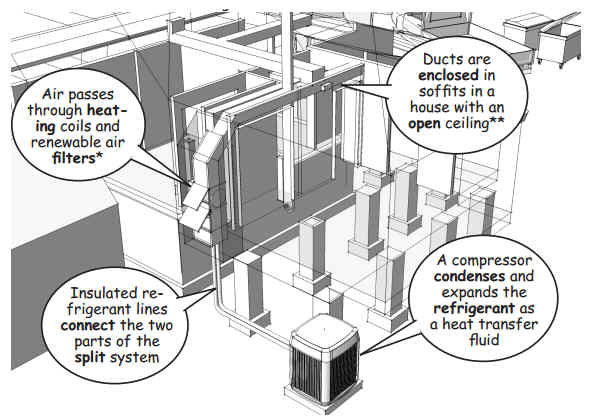 Ducted HVAC requires careful planning prior to construction. The system evolved from central furnaces or fireplaces that distributed heated air through “tunnels” built into the walls of now antiquated structures. The conditioned air was lost through doors, windows, chimneys, and vents. No air was returned to the heat source. Ductless systems are much simpler. They send the “refrigerant” through copper tubing from an exterior unit to the coils in fan units located in each interior space (See Solar Colwood and next month’s illustrations). The material presented in this series has been taken from our book, “How a House is Built: With 3D Construction Models” The book includes annotated illustrations, captioned text, videos, models, and the 2D Preliminaries.